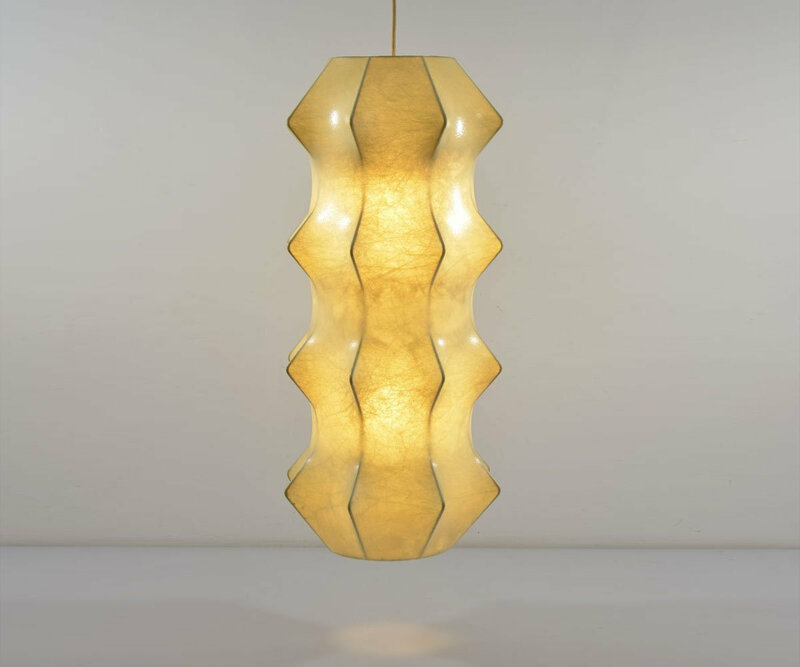 Rare Cocoon pendant designed by Achille Castiglioni & Pier Giacomo Castiglioni for Flos. Unusual extra large version in really fantastic condition with beautiful fibers. No holes or tears or other damage at all. White painted metal structure on which a ’Cocoon’ plastic resin is sprayed. This one belongs in a museum! In this good condition you don’t see often. Has two lamp fittings and is easy to change bulbs. This is not a remake but an original version. Be sure to order it quick since you won’t find one like it again. Great for collectors of mid century modern design. It is securely packed and ready to ship. We ship worldwide from New York to Tokyo. Insured delivery to your doorstep! The lamp uses a standard E27 screw fitting light bulb, so it can be used in the USA. Dimensions: diameter 33 cm, height 70 cm.